“Lady in Black” Bracelet: Chunky, Acrylic Beads in Black Are the Main Focus in This Exclusive, One-of-a-Kind Beaded Bracelet. Artisanaworks Re-Creates the Retro Jewelry Look With Large, Rectangular Acrylic Beads. 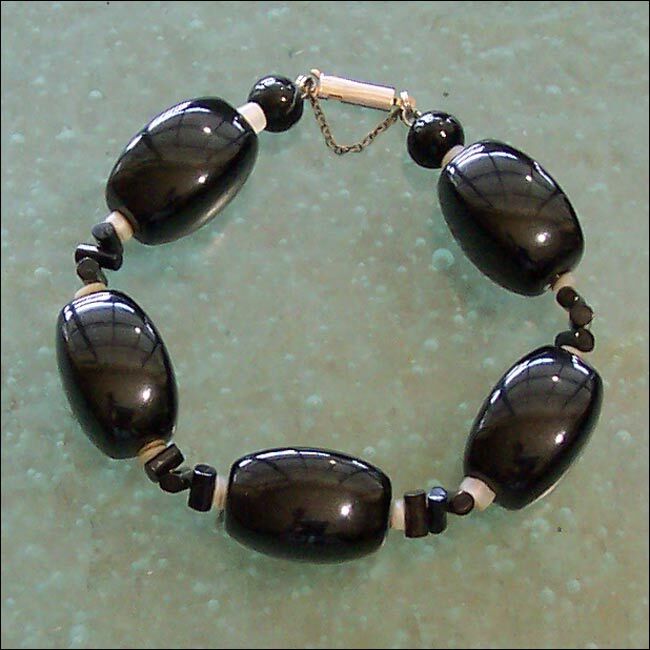 Small Spacers of Translucent White Oyster Shell Beads and Black Lacquered Bamboo Beads Flank. A Simple, Elegant Artisanawear Bracelet in Black and White. Totally Reclaimed, Recycled, And “Green” Fashion Accessory Jewelry. Slide Barrel Clasp and Safety Chain..
Artsy, One-of-a-Kind Jewelry Bracelets Designed and Handmade by Carol Tate, USA.